I recently installed Antergos to my hard drive and it seemed to install alright, but when I boot into it, I can’t crack the password needed to access the OS. “Namespace lookup failure”, “Method parse/execution failed”, “Couldn’t find an interrupt end point”, “No caching mode page found”. When I tried the above password, I get a black screen with a white space symbol flashing in the top left hand corner. Since this seems to go on for a while, I assume that it’s not working, so I try something different. When I tried using the password I set up with my my user account, I get this message: “No key available with this passphrase”. If it askes you for a decryption password, thats what you gave as your encryption password. Not your user password. It seems you are caught in an EFI issue. Do you know anything about the EFI settings in your BIOS? I would recommend looking in your bios for something like Safeboot (Turn it of) and OS-Type, change it to other, not windows. You should not turn UEFI off (legacy) , and you might have to reinstall. @izznogooood Well, trying to install Antergos has proven disastrous…I’ve got two internal drives, one was empty, which I tried to install Antergos on, and the other had Windows 10 running on it. Antergos is very bad at making clear what drive you are attempting to install on. I’ve tried installing it on sda, and sdb. In both instances, my OTHER drive was wiped out and I had to restore Windows, which was annoying. Being a glutton for punishment, I thought I’d try again and hope to get some helpful tips from here. I’ve tried using Rufus to install Antergos onto my internal drive, once the live version is running on my bootable USB. That should be possible to do, right? With Rufus, I’ve tried the ISO option, and the DD option, I think it is called. It seems to me that these did not work. Or did they? I.e. When I setup Antergos in the installation process, I choose to encrypt my drive. Is that a good idea? Can it be done after installation? In any case, when I boot into the drive which I assume has Antergos installed on it, I have to input my password. Assuming that that works, I get a black screen with a flashing underline symbol or something in the top left-hand corner of the monitor. It stays there for a long time, making me think that something has gone wrong. Has it? If not, how long before I should see the desktop? Is the process always at that slow, if nothing is wrong my installation? As for my BIOS, it has no option that I can see for safe mode…but I have the Tweaking app and I had enable the Windows F8 boot menu, which I assume is safe mode? The same as safeboot? I’ve disabled that now on Tweaking. Do I have to? If I can successfully install Antergos, can I enable safeboot then? Anyway, I think that I have Antergos installed on my other internal drive but I’m not sure if its working properly, so I might want to install it again, using Etcher this time, I think, in case that brings me more luck. How do I ensure that I don’t wipe out my main internal drive which has Windows 10 on it? On what do I install the installer or whatever you call it? I.e. it’s an option in the installation process that Antergos requires of you. What other options should I choose in the installation process (apart from the obvious ones like installing NVidia drivers, since I have a NVidia on my PC)? Is there a walkthrough on how to create partitions yourself and what sizes to make them? Is it a good idea to encrypt your drive? Does that make getting into Antergos a painfully slow process once you enter your password? If I have no luck this time installing Antergos, I’m afraid I’ll have to go with something simpler. I tried installing Manjaro but the green installing bar seemed to stall, so I just gave up on that too. Are Arch variants temperamental or something to install? Keep it as simple as possible. Try plugging in ONLY the hard drive you wish to install Antergos on and let the installer use entire disk. If you are unsure which disk is which you can boot the iso image from USB and run Disks. 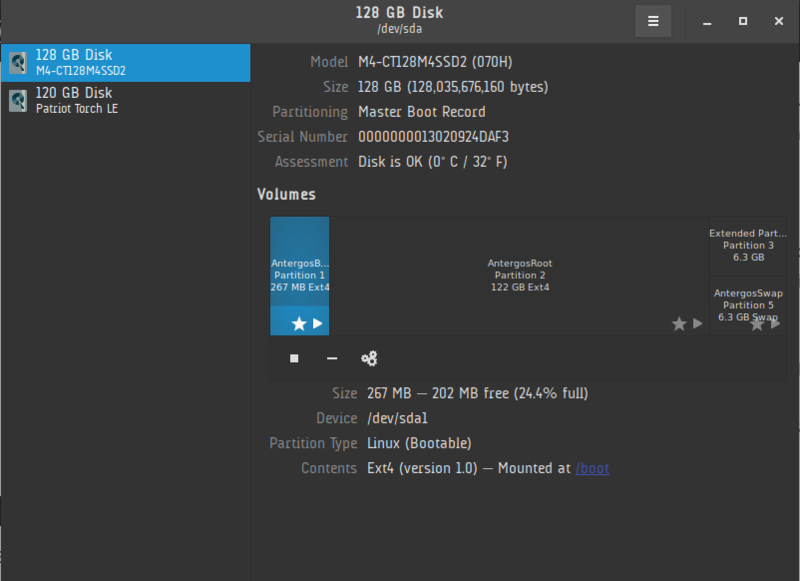 After you have ONLY the linux HD installed let the Antergos installer (Cnchi) use the entire drive it will format and install partitions as needed. Set your timezone and keyboard to US other then that I would leave everything default. You can install nvidia drivers and encryption after yes. Once you have Antergos installed to disk then install the winblows drive back in the computer. Protip: Always power off and unplug computer when changing hard drives. You can mount the windows drive using the arrow button and browse it. Which seems to indicate you have Nvidia graphics and need a special ISO for install. The last package (lib32-nvidia-utils) is only needed if you installed steam. This will prevent you also from not knowing wich HD is windows on, as you can see them all in the partition screen. 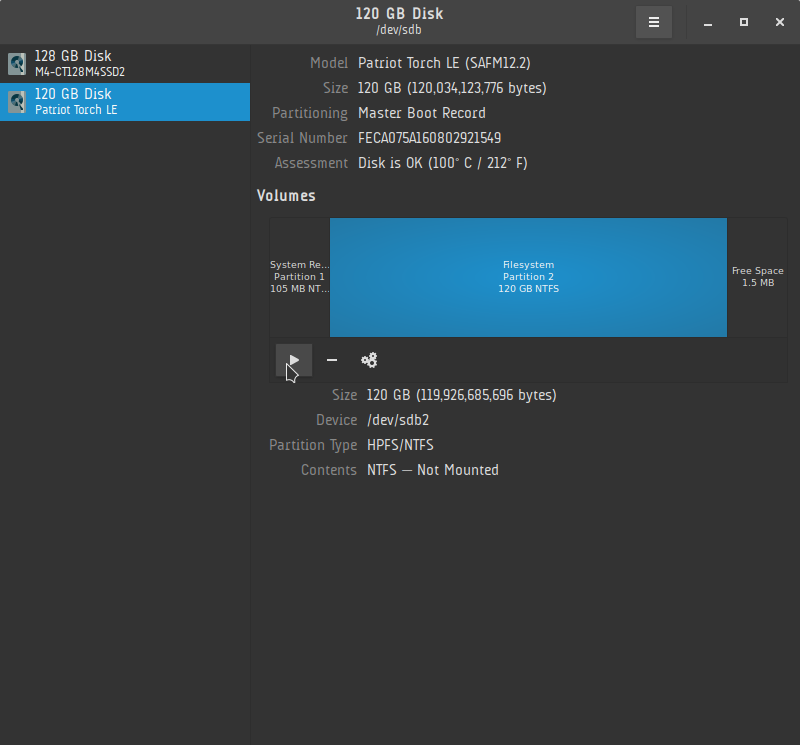 This is for having Windows and Anterghos on the same HD (disk) but it shows how the partitions for Antergos will be created. If you realy have the need of encryption, you need to have a plan what it is about. It is very simple to setup and also to use, but nothing like a simple addon you can install and remove. @underclock Since I haven’t tinkered with my PC’s internals, disabling drives seems pretty daunting to me. Not sure if this makes a difference, but I was trying to install the Cinnamon version of Antergos. Like I said, I was using Rufus, booted in the USB with the ISO on it, and intended to install the entire OS on the drive which did not have Windows on it. My NVidia is a GTX 980, so particularly new. Someone below mentioned that you can’t use Rufus to do what I want to do. Not sure what they mean by that. If I have to mess around plugging and unplugging drives on my PC, I’m just wondering if I’m going to do more harm than good on my PC…I mean, I can’t even install an OS on my unused PC…and now I’m going to be able to do PC tech work on the hardware? @izznogooood I’ll make a note of that. Not sure if I still have the OS on my other internal drive though. I want to install the Cinnamon version of Antergos…you can get a special ISO for NVidia graphics which runs Cinnamon? When I had that blinking screen, I’m not sure that pressing buttons worked, but I didn’t try your advice, so I’ll try that next time. With that sudo command that you typed, since I don’t intend getting Steam, should I still type it in? Is there a sudo command for NVidia drivers which has nothing to do with Steam? Does the “lib32” refer to a 32 bit OS? I’m after the 64 bit version, if there is one. @joekamprad re your comment that it’s “not possible” to use Rufus to install Antergos onto my internal drive…how so? I create an ISO on my USB drive using Rufus, then once I boot into it, I choose the “Install it” option…which I presume allows me to install it on my internal drive. I don’t want to have a drive which has more than one OS on it. One OS for each internal drive is what I’m after. What’s the default partitions and partition sizes for Antergos? My drive is about 953 GB. Have heard that you want your Swap to be twice what your memory’s size is, so that would be 32GB for me. However, did read for one distro, that if your RAM is sufficiently large, you don’t need a Swap drive. Assuming that the next time I try to install Antergos, what’s some good stuff to get me started? E.g. firewalls (have heard that PF Sense is good, if not newbie friendly), a Linux equivalent of CCleaner available? Anti-virus needed? As in, whilst Linux might not suffer Windows malware, it might pass them on, right? Can you install and run a different web browser, say, using the command line? Antergos uses Chrome, doesn’t it? Be good to be able to install and run Tor using the command line, but I’m not sure how to do that. @Perry Rufus installs the ISO to the USB Stick, and you are booting the USB-stick with the ISO to install ANtergos to your Harddrive. What you was asking before sounds like you want to use rufus directli to install the Install-ISO to your Harddrive. Swap space will usually be a disk partition but can also be a file. Users may create a swap space during installation of Arch Linux or at any later time should it become necessary. Swap space is generally recommended for users with less than 1 GB of RAM, but becomes more a matter of personal preference on systems with gratuitous amounts of physical RAM (though it is required for suspend-to-disk support). So depending on what you want to do you can make use of swap also on 16GB RAM, but no need to have it, and no need for 32GB, the same size as your RAM is more then enaugh, and i do not know at the moment if the installer allows to do not create swap ? Minimum partition is to create one partition to run Linux, (/) it holds /boot and /home then, but it is smart to have a seperate /home partition so that you can hold it if you need to reinstall Linux one time… same for /boot what holds the Kernel Images, it is a good idea to have thouse save away on another partition. I’ve reinstalled Antergos onto my drive, after managing to disable the internal drive which had Windows 10 on it. “Ctrl-Alt-F3” worked for me to get past that black screen. I entered my Login, my Password and now…no Cinnamon desktop! I was expecting to be taken to a graphical desktop, but instead I am still on a command line prompt. How do I get taken to the graphical desktop? How do I automate the process of getting straight to the graphical desktop? Off: Network time protocol for clock synchronisation; Bluetooth; Chromium; Flash plugins; SSH service; Steam/Play on Linux (can I still play games on Linux? E.g. if I want to create a GOG account, I’d be able to play their Linux games, right? I also used encryption and chose LVM…what’s the ZFS option? With my Windows 10 drive disable, Antergos marked my drive as “sda”. I took out my USB after installation and before rebooting. It would just be good to be taken to a graphical desktop without having to deal with the command line prompt every time I try to log in. Usually you should go straight to graphical login. With ctrl+alt+F3 you get to tty3 a terminal login. You will get info if the graphical login fails. @joekamprad Since I have to get out of Windows to boot into Antergos, I’ll have to reply to you before I’ve had a chance to try anything out that’s recommended here. So, what happens if I don’t get a graphical login? I didn’t last time. I.e. I had a command line Login and Password prompt (tty? ), then I was still on that command line. Do I have to do anything on that command line to enable the GUI? Will doing that make the GUI login permanent? If not, what will? I was assuming that by choosing the Cinnamon option during the installation process that I wouldn’t have to enter more info on the command line prompt…that I would automatically get the GUI login and desktop. That’s what I’d like to happen. this should normaly, installation enable the graphical login with lightdm automatic, if it fails it is mostly caused by a problem with graphic driver. But if you can get to TTY3 you can investigate from there installing, enable disable…the dm e.t.c. [ 1.376742] nvidia: loading out-of-tree module taints kernel. [ 1.376750] nvidia: module license ‘NVIDIA’ taints kernel. I got the following message: “Command not found”. I’m assuming that I entered all the characters correctly, as I couldn’t copy your command from one OS to the other. Will try the grep nvidia command* next but not sure if that requires the previous command to have been entered correctly. What kind of symbol is that between “dmesg” and “grep nvidia”? Is it the character above the Enter key? That was probably a redundant command to enter, right? Anyway, I’ve printed off your reply here and will try them out. P.S. the command you gave which has “systemctl”…it kind of looks like the number one on your message, but cutting and pasting it into my reply here, it looks more like the lower case L…or that weird symbol above the Enter key. That confuses things…be good if commands didn’t include obscure characters or were unclear as to which character they were. Currently I can’t get past the command line type screen which I got after entering your prompts for reinstalling NVidia drivers, in your reply prior to your last one on the vertical bar. I entered those two nvidia commands and was told “You need to reboot now”. Which I did. “You are now in emergency mode. After logging in type…”. I don’t seem to be able to log in though. One message says “press Control-D to continue”, which doesn’t work for me…I have to press Control, Shift and “d”, right? I’ve tried that and just Control and D…still nothing happens. I’m not sure if I’ve made progress since last time…or gone backwards! At some point, early on, I entered your commands for lightdm…can’t remember if that was done in emergency mode though.